On the 28th March 2017 we held a very successful seminar on environmental monitoring for sound and vibration. 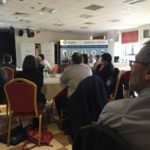 We had nearly 50 attendees at the Sharnbrook Hotel which is close to our offices, just north of Bedford. Speakers included John Shelton BSc(Hons) MSc MIOA, who chairs the instrumentation working group at the IoA, Ian Arthurs from Southdown Environmental, Krzysztof Koltys from Svantek in Poland and George Boersma from Munisense in the Netherlands.